Wearing custom-made sports clothing isn’t just a way to look good; it also can be fun! But what isn’t fun sometimes is the realization that it can be expensive, especially if you have a large order. However, we believe in giving our customers great value with their custom shirts for an affordable price. We work with quality materials, like t-shirts. Our screen printing process ensures that your design is spot-on, and doesn’t start peeling after a couple washes. Everybody makes mistakes, but we work hard to avoid them. So before we go to work on your project, we provide you with a proof of the artwork. You get the opportunity to make sure the design and the colors are right. And if for some reason it isn’t right, we will do the necessary editing. Once we get your approval, it’s off to the races. For nearly a quarter of a century, we’ve been producing quality screen printing and embroidery. Since we began in 1995, those many years of service to the area have not been wasted. Our long list of satisfied customers testifies to the fact that we are definitely doing something right! You could say that we came from “Humble” beginnings. The founders, Steve and Katy Mittag, ran their business from their spare bedroom and garage office until 2015, when they transferred the entire operation to a storefront, where we’ve been ever since. 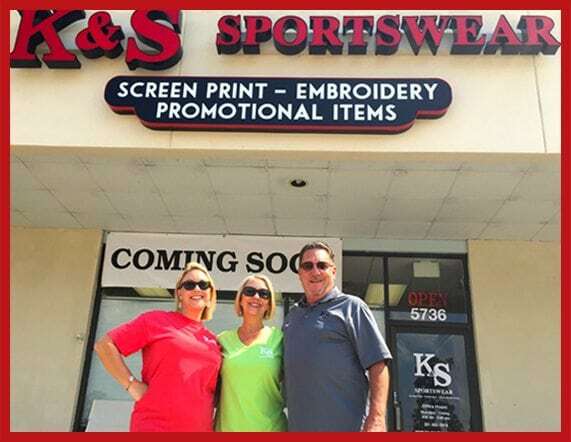 Steve and Katy retired in 2017, but the business is still in very capable hands with their daughter Brittney and her childhood friend and fellow classmate, Sara (Otis) Miller. The best part of all these years of experience we’ve built up is that we enjoy what we do. This adds the most value to you, because someone who enjoys their work is almost guaranteed to provide great service. Whether you choose to go with screen printing or embroidery, the project you entrust to us will have quality written all over it. However, there’s nothing wrong with selecting the option that works best for you. So let’s look at three factors to consider when choosing the process best for you. Generally speaking, embroidery imprinting is less expensive than screen printing when the logo is pocket-sized, especially for smaller orders of fewer than 100 items. Embroidery is also more cost-effective when a logo has several colors since the set-up fee for embroidered logos is usually a flat fee that won’t vary no matter how many colors are used. On the other hand, the screen printing set-up fee will vary based on how many colors are used, since a separate mesh screen is needed for each color. Another factor is that if you’ve chosen a colored base item (shirt, hat, etc. ), then a base print will be needed for screen printing. This is basically an undercoat, to make sure your logo will show up properly on the base item rather than blending into the base color. To put it simply, set-up costs are typically cheaper for embroidery. However, there are some exceptions. For example, larger logos can require tens of thousands of stitches, more machine use, and more thread—meaning more cost for embroidery. If you want a large logo on your item, then screen printing will be less expensive. Also, if you’re ordering a large number of items, then the printing cost will matter more than the set-up cost. So for a large order, screen printing may end up costing less in the long run. One last factor to consider is whether or not you expect to make future, repeat orders for the same items. If so, ask your imprinting company if they offer discounts for repeat set-ups for either embroidery or screen printing jobs. Each material may respond differently to different types of wear and tear. For example, if you’re doing a run for a fundraiser, you might select T-shirts as the material. These will be exposed to sweat and dirt and will be washed several times. Plus, they’ll need to be comfortable and flexible. Screen printing will work great for this application. The design won’t add weight to the shirt and moves with the shirt. If you’re ordering workplace shirts for your staff, these will not have to be washed as often, and the same shirt won’t be worn every day. But down the road, you’ll want the shirts to look the same as when you ordered them. So embroidering is the choice here, as screen printing will eventually wear off with several washes. Business shirts: embroidery. For button-up shirts, usually a more formal look is desired. Embroidery creates this high-quality effect and will stay pristine for years to come. Polo shirts: Embroidery. Similar to business shirts, usually collared polo shirts are wanted for workplace environments, so embroidered logos help a polo look more formal for that setting. An exception would be if a very large logo is needed (on the back of the shirt, for example)—in this case, screen printing is preferred. T-shirts: Screenprinting. Screen printing is a more casual look, which fits T-shirts best. Embroidery can also feel too heavy on t-shirts, and sometimes causes puckering around the logo when applied to the lighter t-shirt fabric. Jerseys: Screenprinting. To be light enough for sports use, and to stand up to multiple stains and washes, screen printing is the way to go. Jackets: Embroidery. The heavier material of jackets makes them perfect for embroidered logos (think high school letter jackets). Hoodies: Screenprinting. Hoodies usually have a more casual look and feel, which makes screen printing a better fit for them. · Caps: Embroidery. Logos will show up much better and have a longer lifespan on baseball caps and other headwear than screen printing would. If you’re trying to get affordable custom shirts, and have a pocket-sized logo, and you’re ordering less than 100 items, embroidery is generally less expensive. The setup fee is one-time, and isn’t dependent on the number of colors. On the other hand, the setup fee for screen printing is based on how many colors you use, because each color is applied on a separate mesh screen when it goes on the screen printing machine. Simply put, each color increases the cost of your setup fee, and thus, adds to the cost of your project as a whole. However, embroidering larger logos sometimes requires tens of thousands of stitches, which also means more thread, longer machine use, all of which increases the cost. So depending on the material, your large logo will be less expensive with screen printing. When it comes to large orders, though, it’s the printing cost that is going to be of consequence to you, rather than the set-up cost. So if you’re planning on a large order, and you’re biggest concern is the cost of the project, you may be better off in the big picture going with a screen print application. Another area where the cost will matter is repeat orders. If you plan on more orders of large quantity items down the road, then it might pay to ask your screen printing and embroidery company if they have discounts for this. In fact, when you start working with them, bring up this detail to them. You could get a huge discount right off the bat! And most companies would be glad to offer discounts to keep your business. So even though we’re talking about cost differences, quality is still the number one factor, whether you choose screen printing or embroidery. Our aim has always been to give our customers a great experience, which includes offering a high level of value for the investment you make.